In 2004, Shakespeare’s Globe in London began a daring experiment. They decided to mount a production of a Shakespeare play in ‘original pronunciation’ (OP) – a reconstruction of the accents that would have been used on the London stage around the year 1600, part of a period known as Early Modern English. They chose Romeo and Juliet as their first production, but – uncertain about how the unfamiliar accent would be received by the audience – performances in OP took place for only one weekend. For the remainder of the run, the play was presented in Modern English. The poor actors had to learn the play twice. The experiment was a resounding success. It turned out that all sorts of people were interested in original pronunciation – what it sounds like, how it affects actors’ performance, how historical phonologists reconstruct it (the ‘how do we know?’ question). At the talkback sessions following the performances, alongside British Shakespeareans there were early music enthusiasts, people involved in heritage sites, and visiting theatre buffs from abroad. They all had one thing in common: they wanted to get closer to the speech or song patterns that would have been around in the Jacobethan period. The Romeo performances had convinced them that this was possible, and they wanted a slice of the action. As did the Globe itself, of course. The following year the experiment was repeated. But instead of a tentative toe in the linguistic water, a new production of Troilus and Cressida was entirely devoted to OP. Ten years on, it’s interesting to reflect on the way events subsequently ‘galloped apace’. In the Shakespeare world, the Globe went in other directions and the initiative moved to the United States. In 2006, OP extracts from Shakespeare were presented during the 400th anniversary of Jamestown celebrations. In 2007 OP readings took place in an off-Broadway venue in New York. In 2010, a full-scale OP production of A Midsumer Night’s Dream was put on at Kansas University, and this was followed up by a recording for radio and a DVD (now available commercially). In 2011, another university production, this time at the University of Nevada (Reno) mounted an OP production of Hamlet. My actor/director son Ben, who was becoming an expert in OP performance, was invited to be an artist in residence and to play the Dane. I was the consultant on both these productions and saw the results. Thanks to solid and sustained periods of rehearsal by all concerned, the original pronunciation was phonetically excellent. It’s absolutely essential to devote time and expertise to ensure that the pronunciation is confidently and consistently produced. There have unfortunately been a few instances of companies jumping on the OP bandwagon, and rushing out a production, but without spending the time needed to develop consistency and to think through the various choices that need to be made (for OP allows several alternative pronunciations, just as English accents do today). The number of works I know of that have been produced with appropriate attention paid to the OP has grown dramatically over the past three years, and include the Sonnets, Twelfth Night, As You Like It, Julius Caesar, The Merchant of Venice, Macbeth, and Pericles. At the same time, the number of resources has increased, so that more people are able to hear what OP sounds like, notably via the British Library CD, Shakespeare’s Original Pronunciation, an anthology of extracts curated by Ben in 2012. Ben’s reading of Sonnet 141 in OP for the best-selling app The Sonnets (2013) made the accent reach a wider audience than ever before. But the recording he and I made on OP at the Globe for the Open University in 2011 has had the widest reach yet. It went viral, with over two million hits to date. Shakespeare’s Globe Theatre by Jeff Hitchcock. CC BY-2.0 via Flickr. In addition to the website created to accompany Pronouncing Shakespeare, there’s now a website dedicated to the whole subject of original pronunciation – going well beyond Shakespeare to include anyone exploring accents from any period of the history of English. That’s where you’ll find out about those who are using OP to produce fresh versions of Dowland, Byrd, and Purcell, or projects involving other authors. Two of these other authors have had special attention – one earlier, and one later. I made a CD for the British Library of William Tyndale’s Matthew Gospel, in the OP of the early 16th century – a notable difference is that silent letters in words like know are pronounced, so we get gnashing of teeth with a mouth-watering onset. And Ben adopted the persona of John Donne for a recording of his 5 November 1623 sermon. It was selected by the curators of the Virtual St Paul’s project – an online recreation of how St Paul’s would have looked and sounded at the time, with the aim of answering the question how it was possible for 2000 or more people to hear Donne speak in the Cathedral grounds. 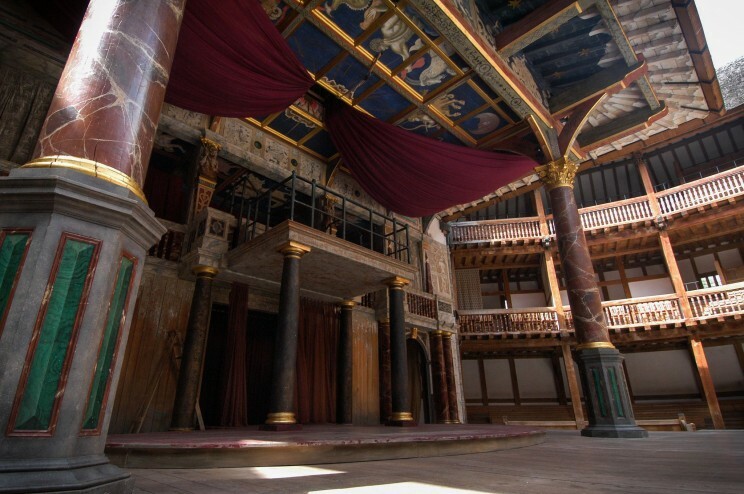 With all this going on, the Globe eventually took another bite of the apple, the opportunity being provided by the completion of the new indoor theatre at Shakespeare’s Globe, called the Sam Wanamaker Playhouse (named after the American actor whose vision it was to reconstruct the Globe). In July 2014 the OP story was told in a three-part series of events, using play-extracts, sonnets, and songs, and ending with a full reading of Macbeth by the Shakespeare ensemble of Ben’s company, Passion in Practice, the foremost developers of OP practice over the past few years. A year later, they performed Henry V in the Playhouse, for the anniversary of the Battle of Agincourt. In January 2015, there was a fascinating OP Pericles in Stockholm, accompanied by violinist Daniel Hope and the Trondheim Soloists, and this will be taken to Savannah in 2016. Other plays and playwrights are waiting in the wings for an OP production, and the demand for resources is urgent – which is why I compiled my Dictionary of Original Shakespearean Pronunciation for OUP. It will be useful for his contemporaries too. It’s an exciting time. People often say that there’s nothing new to be learned about Shakespeare, given that he has been the subject of study for hundreds of years. Not so, when it comes to OP. Every time I explore a play in this way I discover something new – some previously unnoticed piece of wordplay, for example – or experience a fresh auditory impact from individual lines and interactions. With a play that has lots of rhymes that don’t work in Modern English (such as Dream), suddenly all the rhymes work. Audiences immediately notice the effect. When the Three Witches open Macbeth, they speak in rhyming couplets (as witches – and fairies – always do), but ‘Upon the heath’ doesn’t rhyme with ‘There to meet with Macbeth’ in Modern English. It does in OP. Heath was pronounced with a more open vowel. An exciting time lies ahead. As of 2016, only a dozen plays have been explored in original pronunciation, and few places have yet had the chance to hear it in action. Over the next few years I’m expecting there to be many more occasions for audiences to experience an OP production, so that they can judge for themselves the dramatic and aesthetic impact of presenting a play or a poem in a way that is as close as possible to how it would have been performed 400 years ago. David Crystal is known throughout the world as a writer, editor, lecturer, and broadcaster on language. His work on the language of Shakespeare includes Pronouncing Shakespeare (CUP, 2005), Think on my Words: Exploring Shakespeare's Languages (CUP, 2008), and, with Ben Crystal, Shakespeare's Words (Penguin, 2002), The Shakespeare Miscellany (Penguin, 2005), and The Oxford Illustrated Shakespeare Dictionary (OUP, 2015). 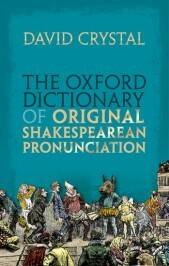 His new book The Oxford Dictionary of Original Shakespearean Pronunciation will be published by OUP in March 2016. Do you know if I can get a DVD (for region 4 – Australia) of Hamlet played in OP? I was in the Globe theatre couple of month ago (Oct 2017) but they don’t have it there. Hi david! I’ve got the same question!